Maui snorkeling is exceptional. 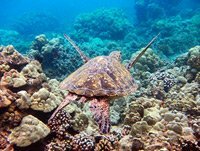 We have snorkeled almost every spot on Maui (and the other Hawaiian Islands) and love its abundance of Green Sea Turtles and free beach access, among other things. So, where are the best snorkel beaches and what boat trips are fun? Really, the better spots are from easy to access beaches, all along the west shore of the island. These areas have healthy living coral reefs that are home to an abundance of tropical fish to watch. There are also some great boat tours available, like the popular Molokini island trip. Click on each location below, for a full review, details and pictures to help you decide on a beach to explore. 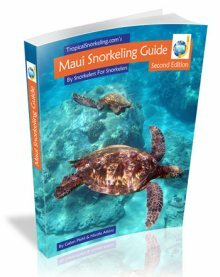 Also don't miss the video, pictures, overview of what you can expect, and the Maui snorkeling beaches map, farther down the page. Poolenalena Beach - See a turtle cleaning station at this great Maui snorkeling spot. 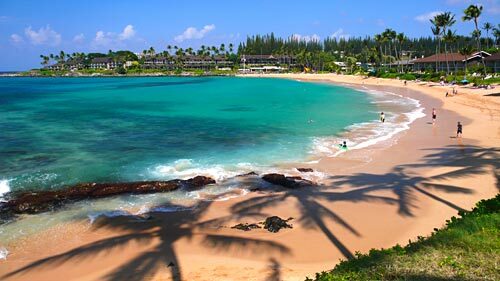 Kapalua Beach - Good north shore snorkeling from a gorgeous beach. Kahekili Beach Park - Easy close access to good snorkeling. Honolua Bay - A big sheltered bay way up north busy with happy snorkelers. Black Rock - The place to swim with fish at well-known Kaanapali Beach. Wailea Beach - A popular resort beach with a good snorkeling area. Molokini - When snorkeling inside this sunken volcanic crater island a few miles offshore, you can see down fifty feet because of amazing water clarity. There are numerous companies that offer trips to Molokini. Lanai - This Hawaiian Island is about eight miles west of Maui. There are many boat tours that do snorkel trips out to Lanai from Maui. What's The Snorkeling In Maui Like? First, watch our Maui snorkeling video for a sample of what you could see. It is from many trips and different locations around the island. Why Is The Snorkeling So Great Here? While boat trips are fun, Maui has tons of wonderful beaches that you can snorkel from for free, on your own schedule. Beautiful, graceful, Green Sea Turtles abound in Maui, and it seems like we keep seeing more every trip. On one recent trip we snorkeled twenty four locations and saw turtles at twenty three. No kidding! 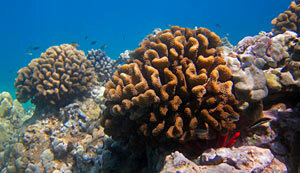 And at most spots we see not just one, but many, slowly cruising around or taking a break, tucked under some coral. You have to know where to find them, but on Maui there are some amazing fields of healthy coral, and some fantastic tall coral heads. Maui does not lack for colorful and inquisitive fish to snorkel with. For a snorkeler, this is pretty important, and the water depths won't disappoint. Be forewarned, the snorkeling on Maui is a bit different than many places around the world (that we have visited at least). This island differs from other snorkel destinations in the world because many of the best spots are not located in protected coves and bays. In fact most of them are around the rocky points between beaches. And basically that means that you are swimming in more open and exposed ocean conditions. There are some exceptions. Maui sees a lot of snorkeling traffic. And like many places, this traffic has a hard impact on the environment. There are a few very popular snorkel beaches on Maui that get most of the traffic. The good thing is since most people don't know where the better opportunities are, they are often uncrowded. It is a good idea to figure out what snorkeling spots you are most interested in before you book your hotel. On our Maui snorkeling accommodations page we give some tips on how to decide. And visiting the right time of year for the best snorkeling conditions can help. 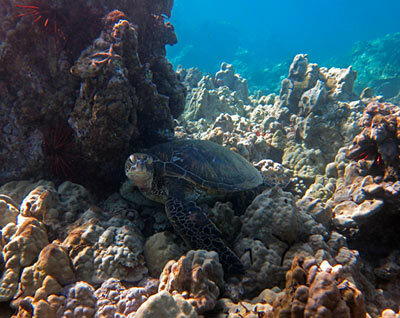 Check out our When To Snorkel Hawaii page. Are Molokini And Lanai Boat Trips Worth It?